Jean-Paul Sartre wrote, “A man is a teller of tales, he lives surrounded by his stories and the stories of others, he sees everything that happens to him through them. . .” Most poets know this. Existentialism is as much a wrestling with the human condition as it is another story. Depending on the character and quality of the stories these could rise to a claustrophobic, tragic fate, or one that liberates through yet to be discovered possibilities. In Jeff Friedman’s new book, Floating Tales, he chooses the latter strategy. There are absurd truths, but truths just the same even as they contradict themselves in the best sense that the opposite of a profound truth maybe another profound truth, and also the aesthetic revelations that can only be found in the crazy prose-poem world that Friedman writes. As the poet is driven to sing the world it is transformed, unexpectedly transmogrified, into beauty and tragedy. Yehuda Amichai writes of this existential dilemma: The song of the turtle dove mourning/is the song of the turtle dove wooing. There is often an ominous quality even in the most prosaic pursuits that lead to surprise and disintegration. The author assembles fantastic tales only to disassemble them, then reassemble them into even more impossible worlds, and yet the reader will find her-or himself believing in their possibilities and often laughing along the way. Even if we are turned into pillars of salt we will not stop being repurposed but we can’t escape the import of the old story. To what world’s end is this borsch-belt imagination struggling to describe. Can’t we just laugh, must we excavate some meaning? Well, yes to both. Book-ending this collection of tales are the prose poems Nothing and Whole World in His Hands. Looking for a ground of being, Jeff Friedman has written a series of tales and narratives that have the energy and sudden surprise of a Jack-in-the-Box imagination where the unexpected becomes expected, if not mundane, and the unimaginable is described in the most common every day terms.. But this Jack-in-the-Box is not a toy, it is a matter of making sense of our lives even as we turn the handle listening to the tinny circus music that is about to unhinge our most cherished illusions and upturning most everything we believe. Let’s keep going, she says and deals another hand, then another and another and another until off come the tattoos spreading across the floor: an orange crossbow, a wolf’s head, a Moorish façade. . . the complete Dead Sea scrolls in microscopic print, and a map of the ‘80s. She turns over the cards until I discard my costume of flesh, my bones, my fountain of blood and step out of myself into the air. “One more hand?” she asks. The narrator says earlier in the poem, “ We live and dress in layers. . .but now there’s not much between me and the world.” What’s left after we are stripped down to what we thought were essentials are now gone─without the armor of our culture, social standing, physical presence, and have gone beyond our limits, until there is nothing left? 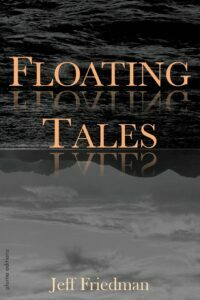 Perhaps more Floating Tales that are trying to answer these fundamental existential questions, or, perhaps the naked, unbridled, wild imagination of Jeff Friedman, as we stand in the swirl of a malignant maelstrom of our own devices in the twenty-first century. When so much today is steeped in futility and hopelessness, it is Friedman’s flights into the darkness of confusion and chaos that turns into an ironic celebration of the one thing that might save humanity, or destroy it, our imagination, our last best stand against the incomprehensible journey we are taking and one where we can’t turn back to the “good old days.” The narratives of Jeff Friedman’s Floating Tales will leave the reader dazzled, spinning in an ever-changing kaleidoscope, where we may not understand our lives any better but we will feel them so much more deeply, and blessed with a moment of liberation.